Heather Nauert has her history right. The Washington Post and other media outlets have launched a lame effort to undermine President Donald Trump’s new nominee for U.S. ambassador to the United Nations. 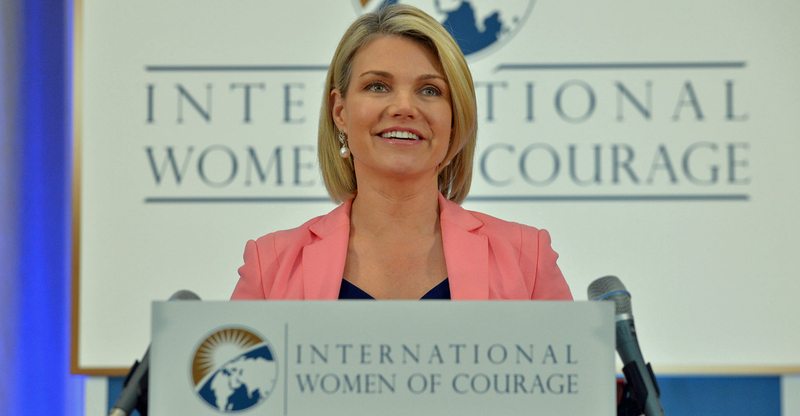 The best they could offer to ridicule Nauert, an undersecretary at the U.S. State Department, was a remark she made in June on U.S.-German relations. The Washington Post found it offensive that Nauert mentioned D-Day as one of the long list of milestones in our transatlantic relationship. Apparently, the Post finds mentioning one of the great turning points in history as poor statecraft. That is dead wrong. Nations don’t build strong bonds of trust and confidence by burying the past and avoiding issues that don’t make for black and white bullet points. In June 1944, the Nazi regime, an anathema to human liberty and decency, held a death grip on Europe. If Americans, Canadians, and British troops had not fought their way ashore who knows how long Hitler’s hideous shadow would have dimmed the light of European liberty. There should never be a day in any conversation, any forum, any speech, where an American statesman feels it’s inappropriate to mention one of the greatest days in the campaign for human freedom. Sure, the allies fought German troops on the beaches. So what? In the Army Staff College, in the War College, when I was stationed with NATO in Germany, I on occasion studied the campaigns of Normandy side-by-side with German military officers. No one was uncomfortable or insulted. It’s part of our common history. Yes, it’s true the U.S. fought in Normandy driven by a single and unshakable animating idea: defeat Germany. Yes, America entered Germany as a conquerer and imposed a humiliating unconditional surrender. The U.S. then joined in the occupation Germany, but in a manner matched by few conquerers in America history. America helped Germany rebuild, recover, and find its path among the world’s nations. In Nauert’s remarks she also mentioned the Marshall Plan, America’s post-war recovery effort that help Europe rebuild. Germany was a key partner in making the Marshall Plan a success—one of the true miracles of post-conflict reconstruction. D-Day and Marshall Plan are the bookends that helped bring Germany back from the chaos of Nazism, famine, inhumanity and more. These events are intertwined. Nauert is more—not less—of statesman for mentioning them. This shows the media may have no sense of history. Or it’s just another desperate cheap shot. What’s clear is that Nauert is well qualified for the task of U.N. ambassador. First and foremost, the U.N. ambassador is America’s global spokesperson. She has been on the job at Foggy Bottom for nearly two years. She knows the issues extremely well. The United States has a clear and sharp agenda at the United Nations—holding organizations and programs accountable; protecting America’s sovereignty and interests; rallying in support just causes; and naming and shaming the worst human right’s abusers and threats to global stability. Nauert is committed to that agenda. She will taking over a solid team. In short, she will pick up where Ambassador Nikki Haley left off. That’s an appointment and a promise Americans should look forward to. The post Media Misses Mark on Heather Nauert’s D-Day Comment appeared first on The Daily Signal.